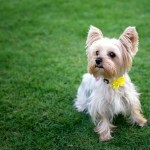 Bentley, an eleven-year-old Yorkie-Pomeranian mix reminds me of the Yorkie I grew up with. 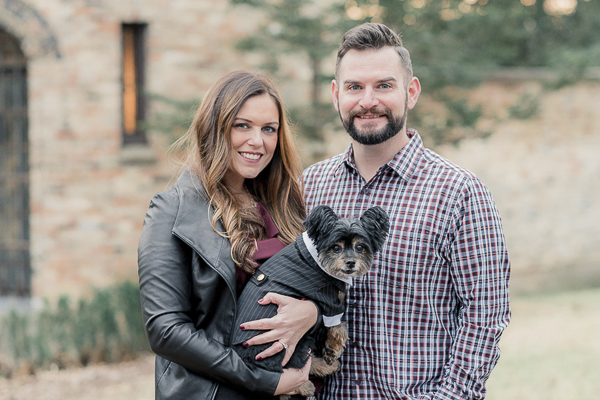 So naturally, I was excited to feature these pictures by Gigi Boucher Photography. However, when I read about the proposal, it seemed like something out of a romantic movie. 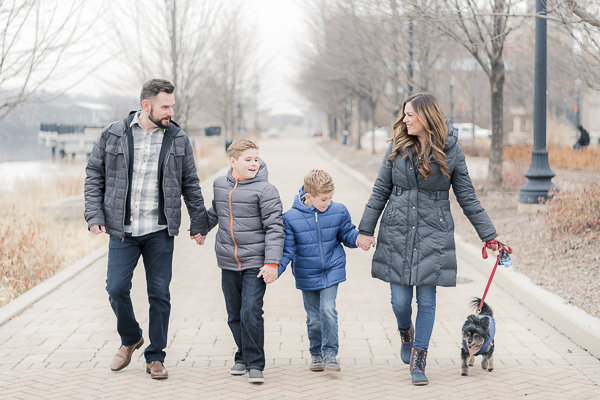 From Gigi: “Heather and Keith’s engagement pictures included two locations in Elgin, Illinois. The weather was cold but warmer than most winter days. 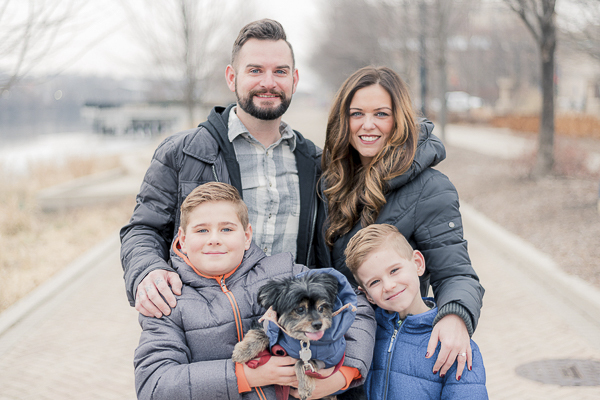 Keith and Heather wanted to include Keith’s two sons and Heather’s dog for the engagement session. Heather and Keith met at a wedding at the Abbey in Lake Geneva. Keith planned the best proposal day ever! 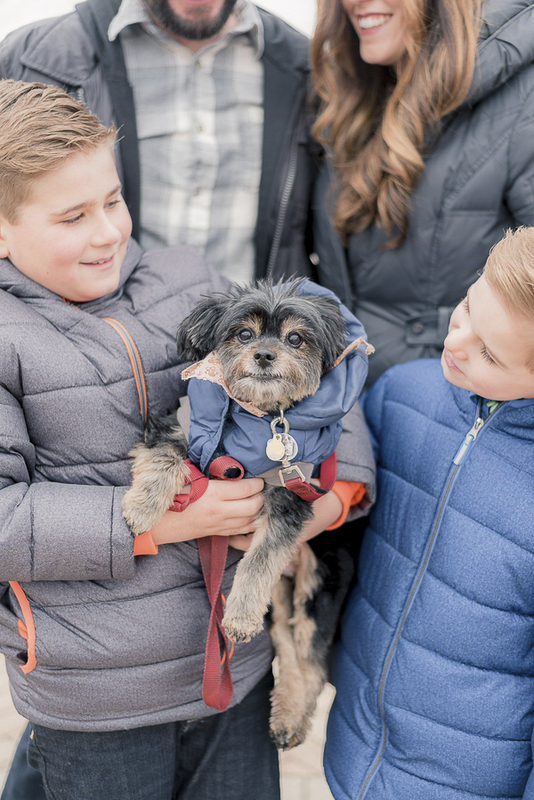 He incorporated his kids, her dog, and all of their best friends and family into a surprise-filled day. Right before he got down on one knee there was a little gift bag for Heather. Heather opened it and it was a little tuxedo for her dog Bentley. From Heather: “Bentley is a Yorkie-Pomeranian mix. Even though he’s 11, he still loves all the same things he did when he was a pup. Bentley loves to do anything and go anywhere. Road trips are his thing. He used to be Heather’s running partner. He loves laying on the back of the couch like a cat. His favorite thing on the planet is sand. Bentley goes crazy over sand, head dives right into it. You can see more of Gigi’s photos, including some of her dog, by following Gigi Boucher on Instagram. 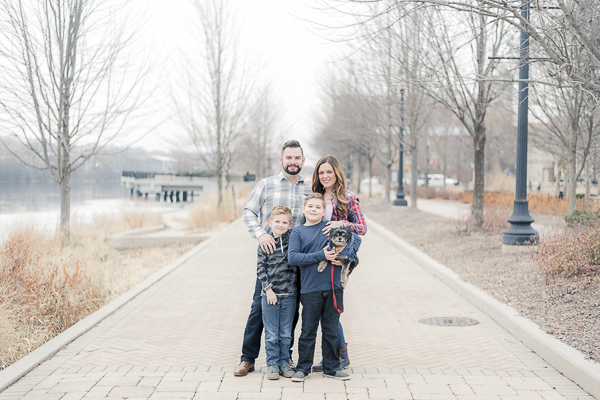 About Gigi Boucher Photography: Serving the Quad Cities in Iowa and Illinois, Gigi is a wedding and portrait photographer. What a sweet looking dog and family! Bentley is such a cute Corkie. Love these photos as always. 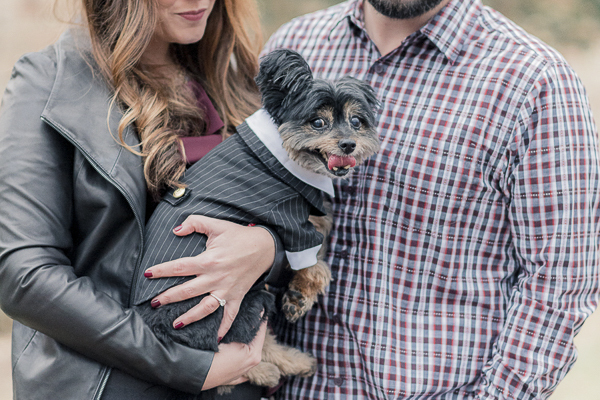 Is it just me or is she marrying someone who looks like her dog? 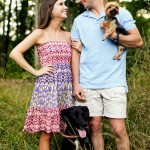 Love that they are a blended family and all included in the engagement session. Bentley is looking sharp! Very sweet and lovely photo session. Congrats to the happy couple! I love the photos and the dog outfits. This was in my neck of the woods since I live in Waukegan, IL. I loved the proposal and the tux! What a lovely family! It is obvious that Bentley approves of his new brothers too. Beautiful photo shoot and superb setting. Bentley is looking rather dashing in his outfit. Bentley has a sweet little face. It’s adorable that the gift bag had a tuxedo for him! Is that for the wedding? I think it is. Won’t he look great in the wedding party? I once was told to watch how a man treats your dog and you will know the type of man he is and a father he will be. It appears you have found a keeper! Bentley is cuteness overload! What beautiful photos that tell a happy story! He looks like a little teddy bear! AH he is so cute! I love all the amazing feedback on my family–in the making. I love all my boys equally because I can’t choose who’s cuter. They have all grabbed a place in my heart so differently. 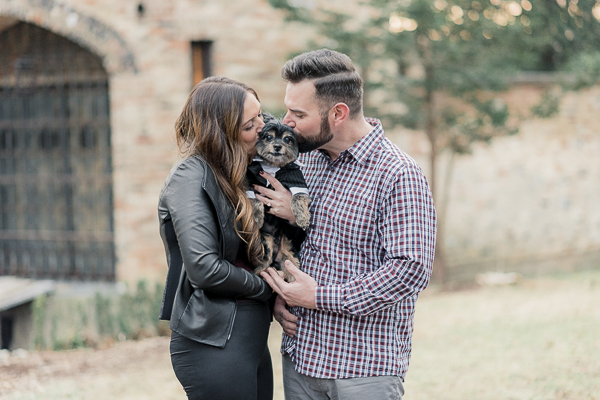 Because this is a blog on my …My First fur baby, Bentley. (Also known has THE BOOGS) I am one proud Mama! He has brought such joy and fulfillment to not only my life but in others that has ever met him. Thank you all for your kid words. Honestly, Gigi is an awesome photographer and I can’t wait to see the amazing work she has to offer for my wedding. Gigi- You ROCK!! He is a very lucky dog! I know your wedding photos will be beautiful! Even though it is hard to wait, timing is really important. I think it is great that you are making sure you will be able to take care of your future dog! 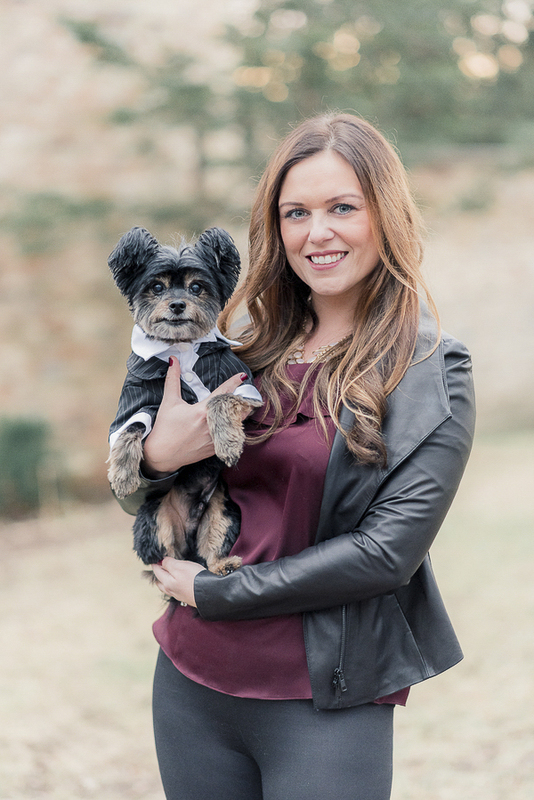 Bentley looks so adorable in his little suit! That really was a romantic proposal! These photos are so lovely, with both of their kids included!